Mangroves should not be used as sewage disposal sites. It is killing them mangroves grow in highly saline, coastal waters, representing a very unique ecosystem. According to an estimate, a mangrove forest supports 100 species of plants and about 500 species of animals, birds and fish. These forests also act as filters for nutrients from water; the fine soil sediments act as sinks for a variety of effluents. Thus these forests have long been used as convenient sites for sewage disposal. It was believed to be good for their growth. 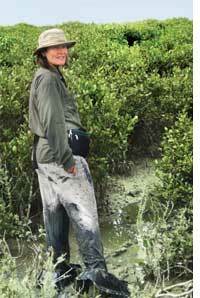 A study by Catherine Lovelock of the University of Queensland, Australia, and her colleagues shows that nutrients from the effluents, in fact, contribute to mangrove tree deaths. Excessive nutrients promote excessive growth of the plant's aerial parts (shoots, leaves, stems) over roots. The roots then find it difficult to balance the oversized tree.This makes the plant susceptible to particularly strong winds and tropical storms. The research was carried out for a period of three to 12 years at 12 sites spread over New Zealand, the west and east coasts of Australia and in two provinces located within the Caribbean basin and in the Indo-Pacific region. Holes were dug around the trees and in each site, six to nine trees were fertilized with 200-300 g of urea or phosphorous--the major components of sewage--annually or biennially. Around other trees used as control, holes were dug but no fertilizer was added. Tree growth was measured by assessing the growth of five twigs per tree in sunlit positions annually or biennially. Information on the climate was obtained from the meteorological department. Salinity of the water extracted from the soil at the base of the tree was measured. The data were correlated using a mathematical model. Results showed trees that were fertilized were more susceptible to death. The researchers say that increasing availability of nitrogen in the water left the roots inadequate to tackle stressful environmental conditions: drought periods, especially in areas where saline soils reduce the ability of the plant to absorb water and in conditions of low rainfall. Fertilization with phosphorus was not as harmful. It was found to improve the plant's water uptake under highly saline conditions. Forests on the shoreline (seaward fringe forests) were found to suffer negligible tree deaths as they were regularly flooded by the tides. This flushed out the chemicals but in the scrub forests further inwards, more trees died as they were less frequently inundated. "The water around the mangrove roots provides a sheltered environment for shrimp and fish and hence an ideal marine nursery. The trees also act as barriers protecting the inland from natural calamities," said Sujata Kaisary from the National Institute of Oceanography, Goa. Nutrient enrichment along the coastal areas is leading to frequent algal blooms and coral reef degradation which further cause tree deaths. In extreme cases, the area could turn into a dead zone, said the study published in the May 19 issue of PLoS One.